All is going to plan until a dead body is discovered, drawing Vicky straight to the scene of the crime. After the last murder Vicky had vowed to stay out of Sheriff Cash’s way, but when death comes to town she finds herself embroiled in the investigation. She’s racing against time to uncover the murderer…but can there really be a second devious killer in Glen Cove? Vicky will stop at nothing to get to the truth. It is always refreshing that when a book is more or less a direct continuation of the previous book in a series, that the opening chapter, provides all the refresher information you require, to remind you of the key bits of the previous books. In Grand Prize: Murder! we get just that, which gave me a welcome reminder of the feel of the first book, the characters and had me focused a lot quicker on the new story than if it didn't. I also believe the opening will be helpful for anyone that didn't read Dead to Begin With, and thus this new book can easily be read as a standalone. As I may have mentioned this is the second book in the Country Gift Shop Cozy Mystery series, and it was great fun to catch up with the residents of Glen Cove again, as they are looking forward to Bella Brooke's visit, for a book signing. Bella is a cozy crime author herself, but before long she finds herself being a suspect of two murders - one real and one in the scavenger hunt that has been arranged for the residents of Glen Cove. What Vicky is adamant about is that Bella is innocent, so she and her friends once again take on the role of amateur sleuths, while also sharing information with Cash, the town's sheriff. I love the whole small town feel of Glen Cove, and of amateur sleuths, attempting to solve a crime with limited resources but just their cunning and common sense, as is the case in a cozy crime book. I was really enjoying seeing how Vicky came to her conclusions, and the ways of getting information from people. At no point did I suspect the correct person, although I did have some other theories, I do like being surprised though. There is a some character development in the recurring characters in this book, so I did feel as though I was getting to know them more. 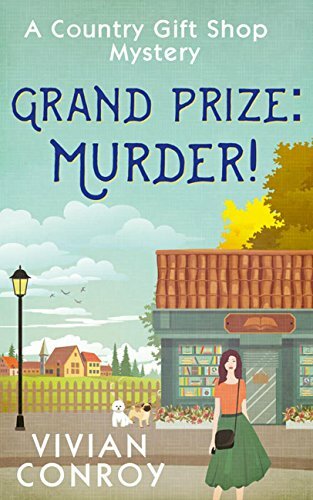 Grand Prize: Murder! is a good cozy mystery, with some fun elements, a clever plot, and a main suspect from the police, that had some brilliant answers! I really enjoyed reading this book, and definitely will be in line for book 3 of the series.